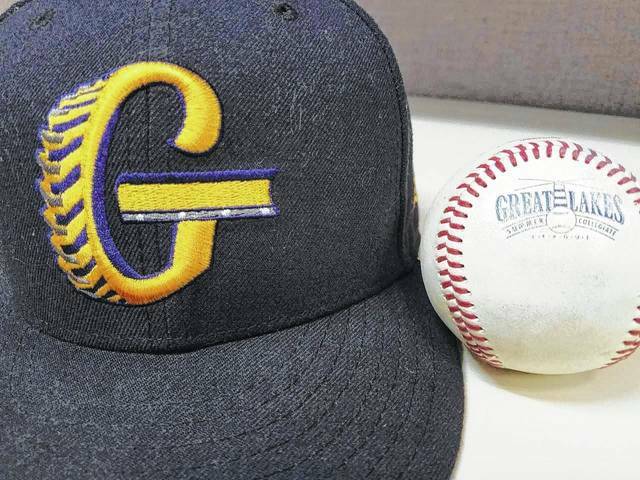 XENIA — The Galion Graders took to the road to face-off against the Xenia Scouts for their final series before the Great Lakes Summer Collegiate League all-star break over the weekend. On Saturday, July 14, the two squads met up for the first of the two games scheduled for the weekend and it would be the Graders staying hot on offense in a 10-4 victory. Galion tallied 15 total hits en route to the 10 runs, despite leaving 14 batters stranded on the base path. Xenia finished with 1o hits to plate their four runs and would leave 11 on base. Both teams committed two errors in the field of play on Saturday. The Graders wasted no time getting on the scoreboard in Xenia. Jacob Reimold drew a two-out walk before moving all the way over to third on a Juan De La Cruz single. Matthew Detering would lace a single of his own to get Reimold across and give the visiting Galion squad the early 1-0 advantage. Xenia would answer with a run of their own in the bottom of the first thanks to a pair of singles and a wild pitch from Graders starting pitcher Gaetan Sinisgalli to knot the score at one run apiece. Eric Wentz began the Galion half of the second with a lead-off double and would be followed by a Cole Andrews single to put runners at the corners with nobody out. Austin Harper would drive Wentz in on another single before Todd Sekowski loaded the bases with one out. Reimold knocked a double of his own to score Andrews to put the visitors up 3-1. Another pair of singles, mixed with a Galion error and a walk led to a Scouts run to put them within one run heading into the third. The third inning would see the Graders record a pair of hits but failing to tack on any runs before Xenia went in order in the home half of the frame. Galion would use that as an opportunity to distance themselves from their hosts in the fourth. Sekowski knocked a one-out single and proceeded to put himself in scoring position by stealing second, his 11th steal of the year. It wouldn’t have mattered what base he was on as Reimold took the ball out of the park for his fifth knock of the year to put Galion ahead by a tally of 5-2. Xenia would not have an answer for the long-ball in the bottom of the fourth. To begin the fifth, Andrews found himself at first after an one-out walk to send up Harper. Harper ripped a double to plate Andrews and extend the Graders lead. The scoring would not halt there though as Harper advanced to third on a Christopher Jordan 4-3 groundout and would later score on a wild pitch. Now trailing 7-2, the Scouts rambled off four singles in the bottom of the fifth but it would amount to just one run thanks to a crafty, 4-6-3 double play by the Galion infield. Both squads would manage a run apiece in the sixth, even though only Xenia recorded a hit as the Graders scored via two errors by Scouts shortstop Nicolas Tuttle. Throughout the seventh an eighth innings, Galion would tack on a single and a double but fail to add any runs while Xenia posted just one hit, a single, in the eighth. It was a similar story for the visitors in the top of the ninth. Heading into the final frame, the Graders already boasted an 8-4 but would plate an additional two without recording a hit and held the home team to just one runner in the bottom of the ninth to secure the 10-4 victory. Sinisgalli earned the win for Galion, going 5⅓ innings and allowing four earned runs on eight hits while walking five and striking out five. Nick Smith finished the contest off for the Graders, scattering two hits while walking two and striking out a pair. Offensive statistics for Saturday’s contest were: Team- 15/43, 10-1B, 4-2B, HR, 10R, 7RBI, 2SB, 8BB and 7K; Jordan- 1B, R; Sekowski- 2-1B, R, SB; Reimold- HR, 2B, 2R, 3RBI; De La Cruz- 1B, R, SB; Vince Donato- RBI; Detering- 2-1B, 2B, RBI; Wentz- 1B, 2B, R; Andrews- 2-1B, 2R and Harper- 1B, 2B, 2R, 2RBI. XENIA — The Galion Graders were able to successfully close out the first-half of their season with a victory at the hands of the hosting Xenia Scouts; 11-3. With that win, Galion headed into the all-star break on a four-game winning streak and having won seven of their last 10 games with a record of 16-14. It is quite the opposite for the Scouts as they drop to 9-23 overall and are stuck in a six-game skid, all while dropping nine of their last 10 games. Unlike their game from Saturday, offense was sparse until later in the contest on Sunday. Galion would open the game with a run in the first after Reimold, Wentz and Sekowski all racked up singles in the frame to plate one. Both teams would see mutiple baserunners throughout the first four innings but as they headed into the fifth, the score would be knotted at one run apiece. That is where it all would change as Reimold singled again before moving into scoring position on a wild pitch. Detering would deliver Reimold home on a single of his own before De La Cruz singled and Jordan walked to load the bases but with two outs and only one run across. Harper would walk, scoring Detering and Wentz would walk as well, scoring De La Cruz and leaving the bases juiced. Sekowski would belt a single to score Jordan and the bases remained loaded. That was before Reimold stepped in for his second at-bat in the fifth and scored Wentz and Harper on a ground rule double before the top of the inning concluded but not after Galion racked up six runs on five hits, even while leaving two runners on. After Xenia went in order in the bottom of the fifth, Donato and Wentz would connect for singles in the sixth and the Graders would tack on two additional runs, while leaving the bases loaded, to stretch their lead to 9-1. The Scouts would also go in order in their portion of the sixth. Galion would strand a pair in the seventh and Xenia would waste a lead-off single in the bottom of that frame to send the game into the eighth with the visitors still up by a hefty margin. Galion would see two more ground rule doubles in the eighth off of the bats of Harper and Wentz, leading to a run. Xenia crafted their lone run in the home half after two singles and a sacrifice fly brought the contest to 10-2. Donato knocked an one-out double and would later score the Graders’ 11th run on a two-out single from Jordan. The Scouts, down to their final three outs and facing an eight-run deficit managed just a single and double for one run in the bottom of the ninth to fall to the visiting Galion squad; 10-3. Gavin Lewis was handed the ball as the starter for the Graders and worked the first 3⅓ innings Sunday, giving up one earned run on just one hit, walking one and striking out four. Mac Spears came on in relief and would earn the victory after 3⅔ scoreless innings on the hill. Spears, now 3-0 on the season with three saves and an 1.77 earned run average, allowed just three hits while fanning a pair of Xenia hitters. Bailey Durocher got an inning on the mound, surrendering two hits, an earned run and walking two. Jordan tossed the last inning for Galion in the lopsided victory, giving up two hits and an earned run. Stats for the Galion line-up in Sunday’s win were: Team- 17/42, 13-1B, 4-2B, 11R, 10 RBI, 2SB, 10BB, 6K and 16LOB; Wentz- 2-1B, 2B, 2R, 3RBI; Sekowski- 2-1B, RBI; Reimold- 2-1B, 2B, R, 3RBI, SB; Detering- 2-1B, R, RBI; De La Cruz- 2-1B, R; Donato- 2-1B, 2B, R; Austin Hathaway- R; Jordan- 1B, 2R, RBI and Harper- 2B, 2R, RBI, SB. The Graders finished with no errors in the field and 16 runners left on base while the Scouts scored their three runs on just eight eights, committed one error and stranded six. After the break, Galion will pick back up on the road for a game with the Southern Division leading Cincinnati Steam (23-9) on Thursday, July 19 at 12 noon. The following day, the Graders will host the Steam at Heddleson Field in Heise Park at 7:05 p.m. A doubleheader at Don Edwards Stadium awaits the Galion squad on Saturday, July 21 as they head down to Newark to clash with the Licking County Settlers. On Sunday, those same two teams will meet again but this time on the Graders home field for a game also beginning at 7:05 p.m.